Application objects - Although there are exceptions, application objects can be considered the definition of an application. Service principals - Can be considered an instance of an application. Service principals generally reference an application object, and one application object can be referenced by multiple service principals across directories. What are application objects and where do they come from? You can manage service principals in the Azure portal through the Enterprise Applications experience. 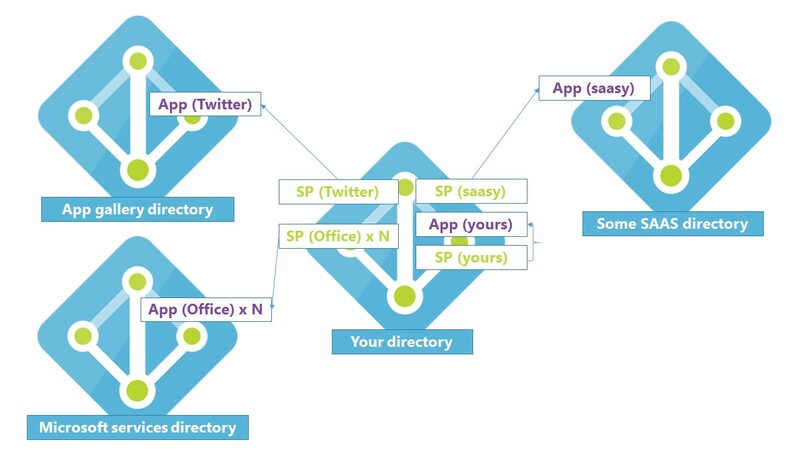 Service principals are what govern an application connecting to Azure AD and can be considered the instance of the application in your directory. For any given application, it can have at most one application object (which is registered in a "home" directory) and one or more service principal objects representing instances of the application in every directory in which it acts. During sign-in, users are asked to give permission to the application to access their profile and other permissions. The first person to give consent causes a service principal that represents the application to be added to the directory. When you subscribe to Office 365 or begin a trial, one or more service principals are created in the directory representing the various services that are used to deliver all of the functionality associated with Office 365. Some Office 365 services like SharePoint create service principals on an ongoing basis to allow secure communication between components including workflows. How are application objects and service principals related to each other? An application has one application object in its home directory that is referenced by one or more service principals in each of the directories where it operates (including the application's home directory). Application publishers/vendors who integrate with Azure AD are required to have a publishing directory (shown on the right as "Some SaaS Directory"). Not all service principals point back to an application object. When Azure AD was originally built the services provided to applications were more limited and the service principal was sufficient for establishing an application identity. The original service principal was closer in shape to the Windows Server Active Directory service account. For this reason, it's still possible to create service principals through different pathways, such as using Azure AD PowerShell, without first creating an application object. The Azure AD Graph API requires an application object before creating a service principal. Why do applications integrate with Azure AD? Who has permission to add applications to my Azure AD instance? While there are some tasks that only global administrators can do (such as adding applications from the app gallery and configuring an application to use the Application Proxy) by default all users in your directory have rights to register application objects that they are developing and discretion over which applications they share/give access to their organizational data through consent. If a person is the first user in your directory to sign in to an application and grant consent, that will create a service principal in your tenant; otherwise, the consent grant information will be stored on the existing service principal. Applications have been able to leverage Windows Server Active Directory for user authentication for many years without requiring the application to be registered or recorded in the directory. Now the organization will have improved visibility to exactly how many applications are using the directory and for what purpose. Delegating these responsibilities to users negates the need for an admin-driven application registration and publishing process. With Active Directory Federation Services (ADFS) it was likely that an admin had to add an application as a relying party on behalf of their developers. Now developers can self-service. Users signing in to applications using their organization accounts for business purposes is a good thing. If they subsequently leave the organization they will automatically lose access to their account in the application they were using. Having a record of what data was shared with which application is a good thing. Data is more transportable than ever and it's useful to have a clear record of who shared what data with which applications. API owners who use Azure AD for OAuth decide exactly what permissions users are able to grant to applications and which permissions require an admin to agree to. Only admins can consent to larger scopes and more significant permissions, while user consent is scoped to the users' own data and capabilities. When a user adds or allows an application to access their data, the event can be audited so you can view the Audit Reports within the Azure portal to determine how an application was added to the directory. In the Azure portal, go to the User settings section under Enterprise applications. Change Users can consent to apps accessing company data on their behalf to No. If you decide to turn off user consent, an admin will be required to consent to any new application a user needs to use. Change Users can register applications to No. Microsoft itself uses the default configuration with users able to register applications and consent to applications on their own behalf.